The Deutsche Energie-Agentur GmbH (dena) - the German Energy Agency - has today given the Energy Efficiency Award to three companies in recognition of their exemplary efforts to increase energy efficiency. The first prize was shared by SCA Hygiene Products for the savings it has made in various cross-sector technologies and Heideblume Molkerei Elsdorf-Rotenburg AG for its successful implementation of energy contracting. The second prize went to Südbayerisches Portland-Zementwerk for its efficient use of waste heat in its manufacturing operations. 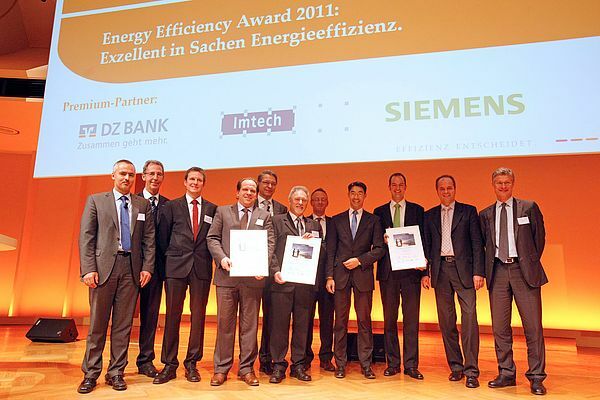 The prizes were awarded during the dena Energy Efficiency Congress in Berlin. This competition, with its total prize money of ?35,000, was organised by dena as part of its Initiative EnergieEffizienz with support from its Premium Partners DZ BANK AG, Imtech Deutschland GmbH & Co. KG and Siemens AG. "This year's prizewinners are an impressive demonstration of the potential energy savings that companies can make by increasing energy efficiency. In doing so, not only are they making a major contribution to environmental and climate protection, but the consequent reductions in costs also give them a distinct competitive edge", commented Stephan Kohler, dena's Chief Executive Officer.